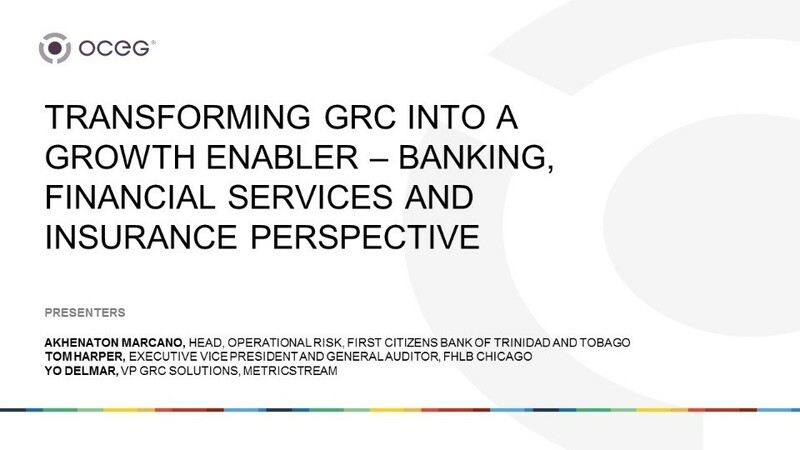 As enterprises strive to stay ahead of the curve, GRC executives will be expected to go beyond their traditional roles as the guardrails of the organization and become enablers of business performance and growth. They will need to find a balance between protecting value and creating it, and between being the voice of reason in the C-suite and enabling the business to take the requisite risks to achieve the desired rewards. Join this session, in which the experts will share their thoughts on some of these areas. This event is sponsored by MetricStream, OCEG GRC Solutions Council Member. This is a group internet-based event for NASBA authorized continuing education credit. OCEG webinars are free for anyone to attend, but only Attendees who have an OCEG All Access Pass will receive a Certificate of Completion for the webinar indicating 1 hour of CPE credit. OCEG is registered with the National Association of State Boards of Accountancy (NASBA) as a sponsor of continuing professional education on the National Registry of CPE Sponsors. State boards of accountancy have the final authority on the acceptance of individual courses for CPE credit. Complaints regarding registered sponsors may be submitted to the National Registry of CPE Sponsors through its website: www.learningmarket.org. For information regarding administrative issues such as complaints or refunds, please contact OCEG at info@oceg.org.